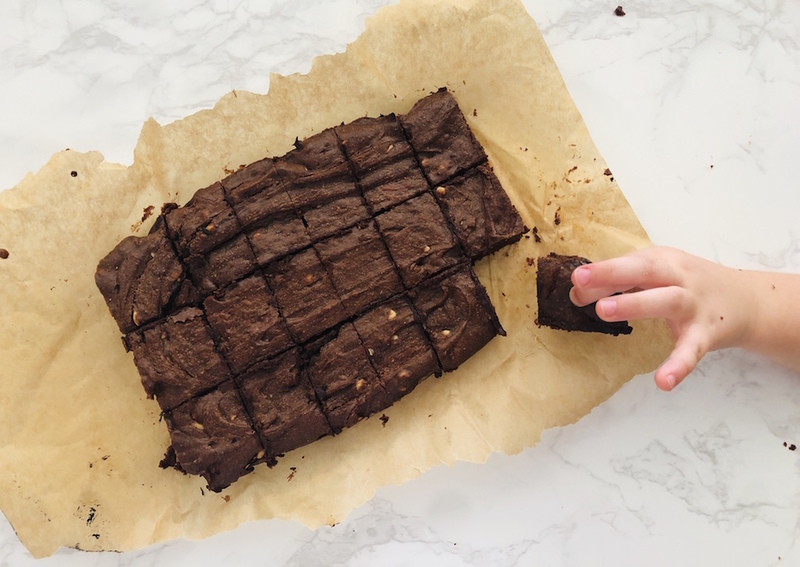 A good brownie recipe is absolutely priceless and when its quick, easy, completely delicious AND gluten and dairy free I think you’ve basically ticked all the boxes!? 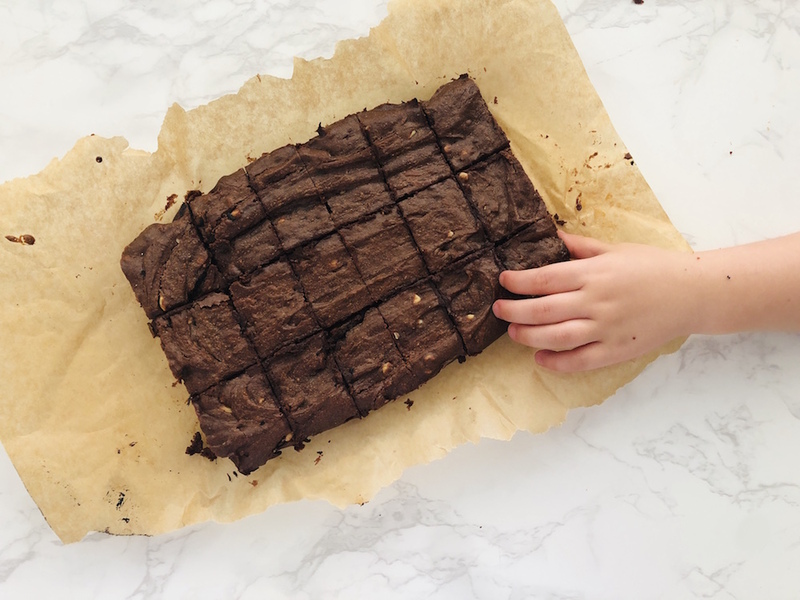 My daughters and I came up with this Peanut + Tahini Brownie recipe one rare rainy day in Dubai when my eldest was desperate to make a chocolate peanut butter cake. It turned out to be a great idea and it’s now become our go-to cake recipe. 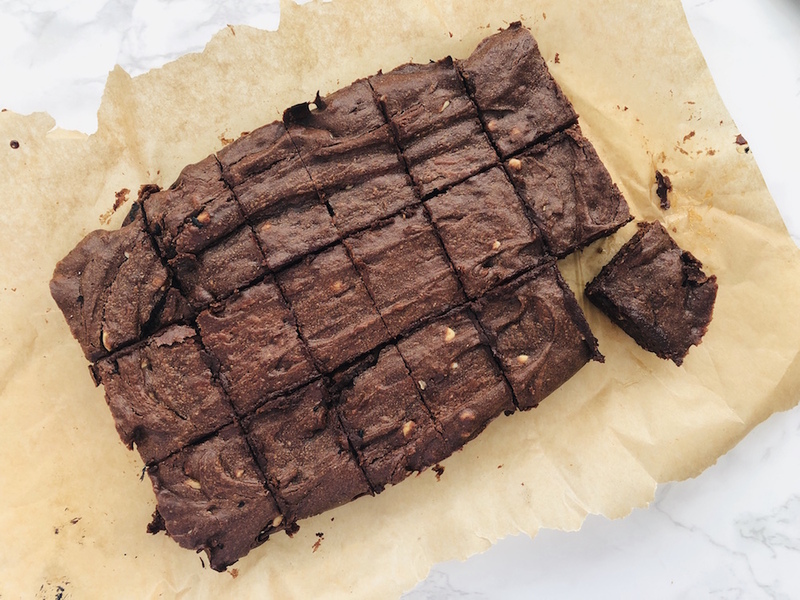 The quantities below make a big trayful – the girls call it our ‘1-Cup Brownie’ but equally you can just make ‘1/2’ or ‘1/4’ cup quantities — just make sure you use smaller trays and cook for 10/15 minutes less. Preheat the oven to 180ºC and line a large rectangular cake tin or baking tray with baking parchment. 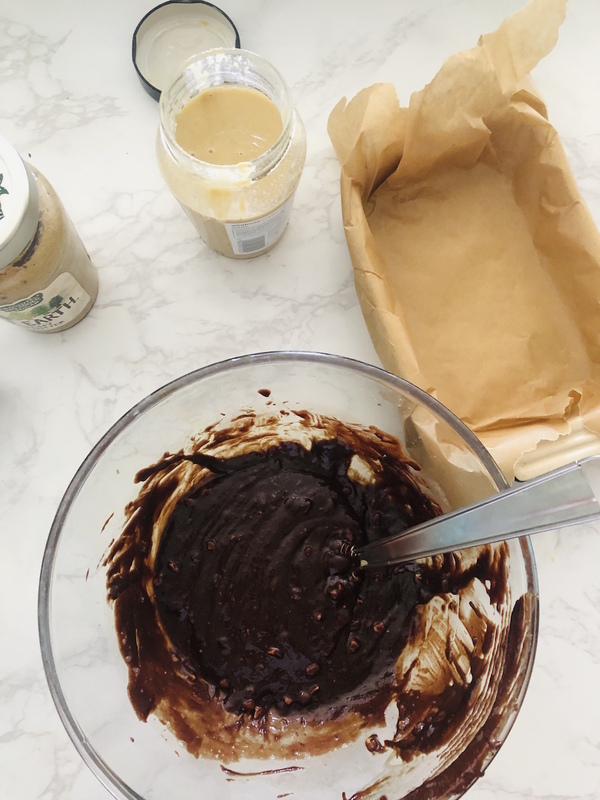 Place the chocolate, peanut butter, tahini and maple syrup in a large heatproof bowl and place over a saucepan of simmering water so that the bottom of the bowl is not touching the water. 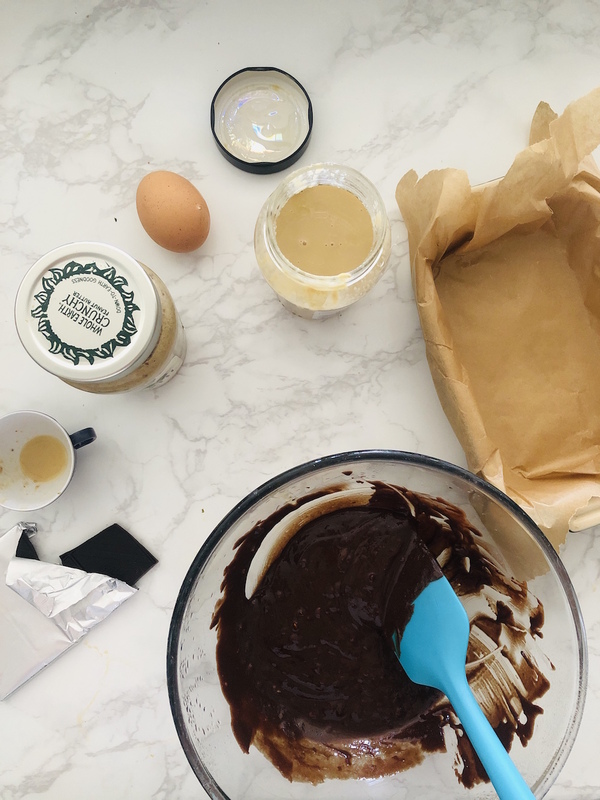 Heat until the chocolate has melted – stirring occasionally. Remove from the heat and leave to cool for 10 minutes. Once cool, add the beaten egg and whisk into a batter. Pour the mixture into the prepared baking tin and spread out evenly. Place into the oven for 25-30 minutes- it will still be a little soft to touch. Remove from the oven and allow to cool completely before removing from the tray and slicing into squares. 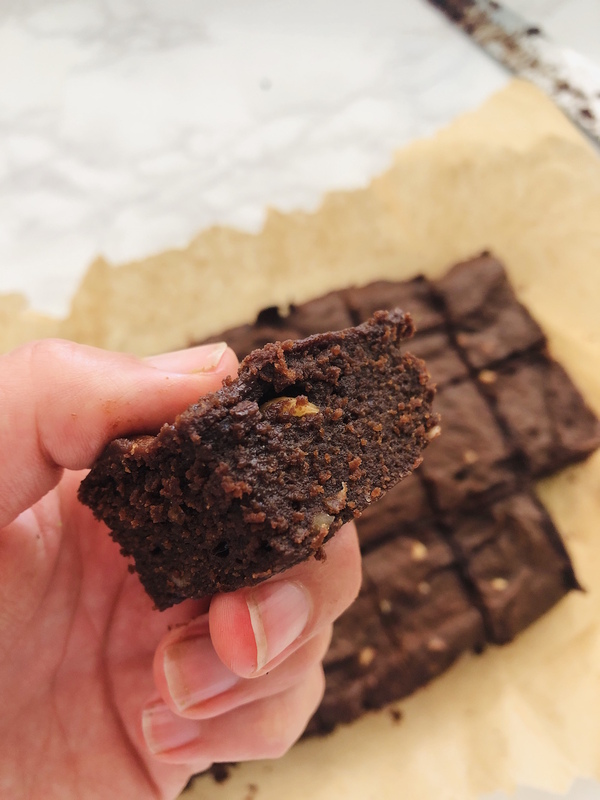 Enjoy your Peanut + Tahini Brownie ✨! PS The moistest banana bread! This looks SO GOOD! I’m going to make this tomorrow 😋. Made these tonight and they were, as described, so easy and tasty and a HUGE hit!